This festive appetizer is a showstopper! 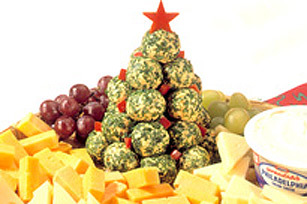 These mini cheese balls are rolled in parsley and stacked like a Christmas tree. Make them ahead for effortless entertaining. MIX cheeses using an electric mixer. Shape into 20, 1-inch balls. Store refrigerated in a sealed container for up to 2 weeks. TO serve, roll balls in finely chopped parsely; arrange small balls into tree shape. GARNISH with yellow & red pepper cut-outs to use as "ornaments", if desired.